SINCERE GREETINGS NEW MEMBERS TO GUITAR GATHERING! Welcome the the home of an enthusiastic music and guitar loving folks of all ages, nationalities, gender and level of experience! Headed by our wonderful instructor, musician, recorded artist and author, Steve Krenz, you'll find a welcoming home here to educate, encourage, and enlighten you on your guitar learning journey! or just browsing on-line for a place to learn guitar, we're glad you're here! TELL US ABOUT YOURSELF, YOUR GEAR, YOUR EXPERIENCE, ASK QUESTIONS (in the appropriate Forum) and BE ENGAGED. WE LOOK FORWARD TO HEARING FROM YOU! Thank you @SandyB53 for this suggestion! Hi I'm Doug aka Eracer_Team, I'm a guitaraholic. Some day I'll get a "Guitar Gathering North" set up for Steve to visit here in Toronto Canada. HEY, You're anything but a NEW guy! There is No Cure for a Guitaraholic, but if you need a Place to Store some of your Excess Guitars, let me be the 1st to Volunteer...? Any NEW members that would like to introduce themselves and tell us about your guitar learning journey? I just discovered your YouTube channel last night and was BLOWN away. The mod for the live stream suggested I come over here and here I am!! I'm in Southern New Jersey, and have been playing for almost 30 years. Had a band in college, blah, blah, blah, thought I might try to become a pro musician, but settled on a professional career instead. School, wife, kids, house, work 6 days a week, but am happy. Get to play my guitar a lot more than ever now that the kids are a bit older. I was a purely digital guy for almost a decade (Axe Fx II) but sold everything I had except my #1 Strat, and started from scratch with all analog gear. It's been refreshing to break away from the modeling realm and has really pushed me to play more than tweak. IT got to the point where I was turning knobs on the Axe Fx II more than playing my guitar, and that was making me grumpy, LOL. I also recently started a YouTube channel "Old Guy's Guitar Vlog" and am having a blast with it. Am I allowed to post links to the vids I make? I know some forums frown on doing that, so please let me know if that's allowed here. Thanks again for inviting me to the forum and I can't wait to start watching some of the back log of vids on YouTube! @Old Guy Welcome to our Guitar Gathering family! We"re glad you're here! (That was me on Live Lessons..Im the "mod" there too) . Feel free to explore and engage with our community members , Chat Live in the ChatRoom, post in relevant topics and visit our resources area. Being a seasoned player you may wish to post your recordings too. @old guy Welcome to the forum! Yes you can post videos. Check out the Guitar Playing & Technique area. You can put your recordings in the Members Recording area. You can also join the Monthly Recording Challenge. My wife and I started the L&M course a year ago and have been lurking on this site since. I finally decided to join in. I'm getting close to finishing Lesson 6 and moving forward. I must admit that I didn't know what I was getting ourselves into when we started the course, but the time and effort that we've put in have been rewarding. I recently started the Speed & Agility Workouts as well. We own three guitars now and look forward to continuing our journey. I'm glad that I chose this course and have have this community to learn from. Welcome Greg and wife! Very nice to meet you. Glad you decided to come out an join the discussions. Sounds like you're doing great at Session 6 after a year is good progress. An the Fretboard workouts are a great tool to add as well. Yes the course is packed full of information for the absolute beginner to the aspiring professional. Look a Collin Hill, (you can find him on YouTube) a young upcoming phenomenal talent who started the LMG course less than 5 yrs ago, and is now performing, recording and teaching! But of course you can work at your own pace and decide on your own goals. Check in often and let us know how you're doing and join us on Live Lessons! I guess this is my second introduction. I am new to the Guitar world. I have always wanted to play guitar. Finally, my journey has started last week with Learn & Master Guitar. I spent the past week playing with a lefty guitar. Thanks to the feedback and suggestions of Steve, Dan Brown, and Tjmeyers i will give the righty guitar a try starting today. Welcome @Greg800 and Wife, thank you for telling us about your guitar journey. Yes learning guitar is a labour intensive operation, it is not for the weak willed! But as you say, it is incredibly rewarding. I know that my life has been enriched by it. I look forward to reading more posts from you and your Wife. Keep up the good work and don't forget to learn some more songs along the way to keep it fun. Welcome @ozy I am glad that you have made it over here! I look forward to hearing more about your guitar journey and reading your future posts. 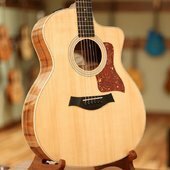 I'm new to your site, and planning on coming to the 2019 Guitar Gathering in June. I'm not sure what to say beyond what I put in my profile. I puttered around with learning Guitar since 2007 (mostly online like YouTube stuff), then dove head first into it after my Wife passed away in 2015. I have joined a local group of people that enjoy playing/listening to Guitar Music (called Guitar League) here in Southern Wisconsin. I'm at a stage where I've done about 2 years of Music Theory (Chords - Open, CAGED, starting alternate fingerings), Scales (CAGED/Box and 3NPS, Starting Modes) Riffs to practice techniques (too many to list LOL), and just starting to sing (Campfire style) while playing. I guess I do mainly Classic Rock, Blues, and am just starting on the Jazz Standards (but I'm sure I have missed a TON of things along my path of learning Guitar). My end goal for playing Guitar is not actually to perform on stage or record, but to Jam with good people and to enjoy all types of music while learning to add a little Beauty to the World. @BKHamreWelcome to our Guitar Gathering family! We're glad you're here.. Im sure you'll fit right in and enjoy a positive learning environment with likeminded folks. Going to the Gathering will be a great experience for you. Feel free to post and join the discussions. And dont forget Live lessons too. Hello @BKHamre great to have you with us. Guitar League sounds like a great group. Have you started to jam with them yet? Location: Full time RV-er. Mostly Arkansas and Florida. Glad to be here and looking forward the 2019 gathering. Came to site and gathering kind of backwards. Searched top rated guitar camps and factored in geography so still getting oriented to the site. Retired, (military) 65 year old who came to playing music late in life. Playing the guitar is a really positive event for me. Skill level can be best described as enthusiastic. My finger picking looks like a public service announcement for cerebral palsy. My strumming sounds like I'm being tazed but I'm working on it. Significant progress seems elusive but every day is one more note, one more chord, and one more ego crushing fight with the metronome. But I end up grinning and my head in a good place so why not keep at it? I have fun and at my age that's about all that matters. I fully expect to be in WAY over my head at the Gathering and that's fine. Going to be fun regardless. I'll just hang in the back, listen and soak it all in like a sponge. I am driving to Nashville so I'll have my truck with me. I'm glad to help out with a lift here and there. Glad to be hear, looking forward to it. Thank you for your service, sir. We are indebted to you for the freedom we enjoy. God bless. Welcome Victor, great to have you with us on this forum. Wow you are going to the Guitar Gathering! You will have a wonderful time and meet some great people there. In the meantime I look forward to reading your posts. Hi @Victor Edwards Let me add my welcome to Guitar Gathering! Thanks for checking in here and sharing a bit about yourself. Feel free to participate in the Forums, ask questions, and receive encouragement. We are of all skill levels from absolute beginner to professionals... and everything in between. So there's always an answer or friendly advice. Going the the Guitar Gathering Summer Conference is a super way to be introduced, learn and have fun. Many participants are newer player/students too. You dont say what course of study you're following, but if you aren't already, I recomment Steve Krenz's Learn and Master Guitar program, produced by Leagacy Learning Systems .https://gx169.infusionsoft.app/app/storeFront/showProductDetail?productId=5 They are available retail as well as on line; just google them. How is playing right handed working out for you? I hope it is going well !! Hi all, im a 37 year old professional photographer living in the United Arab Emirates, and ive always loved all kinds of music. My primary outlet is through DJing (Techno and House). Ive tried playing guitar 2 times before this in my life, once at 18 and once at 30. This is my third attempt! Ive never gotten past being able to bang out a line of an Oasis song or something. Ive never learned an entire song not once. Ive never finger picked, only ever strummed so I am going into the course as a total beginner in terms of playing actual notes. I think ive quit in the past because I had no structure to learning. I would look up a song I like, learn the chords and try to play it only to discover I sucked at it without really knowing why, which killed motivation. I think this course is just the ticket. Im almost done with session 4 at the time of writing and just get more enthusiastic as each practice session passes.